So I'm trying to import back all resources (textures ingame, uibitmap, etc.) contained in .arc files from the old Soulvizier mod. It's OK when the .arc file has a different name from the TQ:AE .arc files. I can put these in the Resources directory of the game. But what to do when you have the same name between a SV .arc and a TQ:AE .arc ? How to merge these ? I don't have the sources of the files inside the .arc (tga, or dds, etc.). This is the case for Items.arc at least. I could try to revert .tex to tga or dds and then import to my mod. But is it the best way to do it, knowing that I don't want to modify these files ? I only want the game to be able to use them. I tried another option : using ARC Encryptor, merging Items.arc (from the Nordic game) with the corresponding Items.arc from Soulvizier. I extracted all files, merged them in a directory (Items\subdirectories), then repacked with ARC Encryptor. But it fails, because ARC Encryptor doesn't create an arc structure like this : Items.arc\subdirectories\. 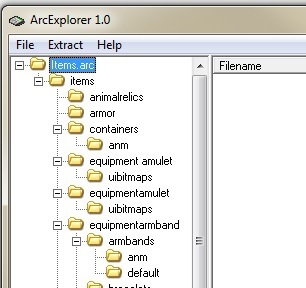 It gives me Items.arc\items\subdirectories ("items" being the name of the directory where the subdirectories are). How can you get this to work ? Aside from this, is there an easy way to convert back .tex files to source files ? Either if these are .tex used for bitmaps or are applied to a mesh ? Place it in the root TQ folder and change the directory in the .ini file from Grim Dawn to TQ.